With a beer glass in the background, writing on the left hand side in big bold letters and a golden shiny bag, these are not only perfect for tavern use, but modern bright and colorful. Chips packaging should be modern or original and this is certainly original. Most Kettle Cooked chips have varying degrees of crunch simply because of the spots the oil hit each Chip. These were no different, but they were thick so were generally crunchy throughout. Kettle Cooked, so thicker than regular chips and with oil seeping through them at high temperatures they were curly and different in shape and size throughout the bag. There was a red food dye on some Chips which remained on your fingers after a bag plunge. Some would say that if all foodstuffs tasted of beer the world would be a better place. Like Ice Cream should have a Cocoa Cola flavor it is only right that the perfect beer companion - the world's favorite snack food - should have a beer flavor. 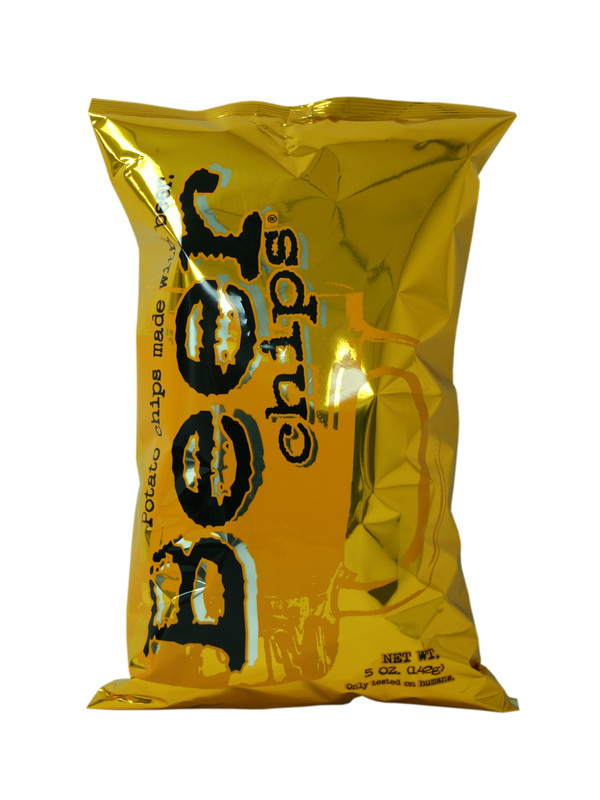 Like beer, the first taste is always the best and these Chips were no different. The flavor faded as the bag was consumed but there was certainly a hint of beer flavor.